By Rick Murray – Doesn’t time fly. It was early October 1992, and Nigel Benn -long-time labelled on both sides of the Atlantic as boxing’s most exciting fighter- is preparing to face awkward, cagey Italian spoiler and WBC 168lb. ruler Mauro ‘Rocky’ Galvano. Known for his smothering, ring movement, clinching and countering, as well as being a former light-heavyweight (Benn was a former middleweight), Galvano started as the betting favourite and pre-fight tip by all pundits. Benn, known for his aggressive power-punching and bob-and-weave style, ripped up the odds sheets and tore into the Champ relentlessly for four rounds, cutting off the ring and landing body shots and right hands. Tough man Mauro was breathing heavily and bleeding profusely and the fight was halted. New WBC King, Nigel Benn -who would hold the crown for a further 10 (often-exhilarating) defenses. Benn switched over in January 1987 after beating every man he faced in the amateur ranks as an Army boxer and ABA competitor. This included future pro prospect Rod Douglas -ranked in the top-five in the World amateurs- and other very good amateur stand-outs in Mark Edwards, Roy Andre and Johnny Melfah. He had 24 knockouts in 28 fights for the West Ham ABC in 1985 and 1986, and in the early eighties won every tournament he entered in the Army ranks. A further 21 straight knockouts (vast majority of which in one or two rounds) followed for Benn following the Ahmed fight. He was a prospect like few before him, his superb natural punching leverages being something to behold -Lethal left hooks, robust right uppercuts, untelegraphed overhand rights, swinging right hooks; they were all capable of rendering an opponent senseless. American import Reggie Miller was a fine prospect himself, as well as being far more experienced than Nigel -this was still Nigel’s first calender year as a pro, 1987! He was taken seven rounds -unknown territory- and still pulled out the big blows at the right time to take Miller out and catapault himself up the middleweight rankings. The Commonwealth Title soon followed and top American Tim Williams was obliterated in next to no time. Such was Benn’s natural power that he could even knock you out on the way down from being knocked out himself, as Anthony Logan found out in their October ’88 clash (labelled in KO Magazine as a ‘British Hagler-Hearns’). Following the one-round destruction of David Noel, Benn found himself in the WBC top-four middleweights by December 1988 and had Bob Arum drumming up a Michael Nunn superfight for him if he got past fellow talented Brit Michael Watson to become a No. 1 challenger. The overdue Watson fight occured in May 1989 in a ‘Supertent’ in Finsbury Park, London. NBC were covering the fight, Nunn, Roy Jones, Chris Eubank and Lennox Lewis were ringside, alongside a host of British celebrities and British sports stars. The atmosphere, with 9,000 people crammed into a circus tent, was like nothing you ever heard before! Benn originated boxing arena entry night and had a glitz and glamour about him that helped transcend the sport, a certain glitz that he carried for the rest of his career. On a major adrenalin high, he laid into the tightly tucked Watson from the opening bell; swinging furious leather at the big, strong Londoners arms, gloves and elbows. This continued for six rounds straight, until Benn had literally punched himself out, allowing Watson to floor him with nothing more than a stiff jab in the sixth as exhaustion set in on the inexperienced, highly-hyped ‘Dark Destroyer’. Watson won via TKO6 and went on to face WBA master Mike McCallum. Benn came close to retiring through embarassment. What sets the great fighters apart is that inner ability to overcome adversity when the chips are down. Benn displayed this, regrouping in Miami, USA and learning the basics of boxing over again, before being unleased on US journeymen Jorge Amparo (concrete head) and Jose Quinones (concrete right) and then gatekeeper Sanderline Williams, one of the most slippery fighters in all of boxing! In three months, Benn had 20 rounds under his belt and a Las Vegas experience, and was given a shot at Doug ‘Cobra’ DeWitt’s WBO world crown in early 1990. As expected, Benn was a big betting underdog against the experienced, tough boxer-fighter DeWitt -who went 50/50 with Thomas Hearns at his best and easily endured Matt Hilton’s pulverising left hooks- but surprised all by dominating the DeWitt fight in DeWitt’s adopted home town of Atlantic City, battering Doug so badly in the first two rounds that his ear had turned Blue! In an exciting fight that saw five knockdowns, Benn had finally realised his dream of emulating his idol Marvin Hagler by becoming a World middleweight champion, via TKO8. Enter Iran Barkley. Perhaps boxing’s most menacing individual, from New York’s Bronx, Iran was renowed for his ability to endure punishment and give it back. Benn again was predicted to lose. Barkley had, after all, knocked out Hearns and ran Roberto Duran and Nunn to the wire in controversial points losses for the WBC and IBF versions of the Championship. Las Vegas, where the fight took place, was also the adopted home town of Barkley. Benn stormed out of his corner and fired an immediate missile, knocking Barkley out on his feet it seemed, and a ferocious one-round maul saw three knockdowns against Barkley for a Benn TKO1 victory! What a title defense! Enter Chris Eubank. With his clipped, upper-class tones and sartorial tastes, Chris Eubank was a pugilist like none before him. He waxed philosophy and agitated both opponents and fans like none had before him. 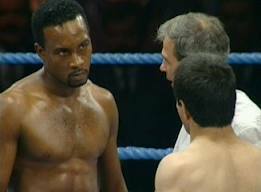 Nobody was more agitated than Nigel Benn of Eubank’s antics, the proud-of-his-roots, working-class war hero. ‘Simply the Best’ Eubank seemed to win this battle before the fight had even took place, with Benn openly declaring that he ‘detested’ and ‘despised’ his developing arch-rival. With fleet feet and short shots in a crab-like, pouncing style -gloves held together at sternum-height- Eubank was expected to cause Benn difficulty to get to grips with, such was his unorthodoxy. But Benn was the betting favourite in a big fight for the first time since the Watson clash. The reason being, nobody knew just how strong Eubank’s jaw was at this point! In a war of attrition, Eubank backed up his boasts, frequently backing Benn into the ropes with laser rights and the flashiest of flurries. Benn would counter to the ribs and kidneys, causing Eubank to back off, and land home the occasional right-handed missile that Eubank would (somehow) absorb. Towards the end of the ninth stanza, Benn caved in to Eubank’s fists and Richard Steele waved off the fight before cupping Benn’s head into his chest as the hero weeped in agony and anguish. It was the most dramatic of affairs. Benn yet again picked himself up and dusted himself down, after flirting with retirement again, and fought quality come-back opponents Robbie Sims (who had never been off his feet pre-Benn), Lenzie Morgan (who looked to have been robbed against Tiozzo in previous fight), and Sugar Boy Malinga, who he undertrained for and nearly upset the apple carts, before finally landing his shot at a second World crown against Galvano, with Eubank uneager to engage him again! Enter the WBC Championship. Benn defended this belt nine times successfully (even reaching the Guinness Book of World Records for defending the WBC belt nine times quicker than anybody in history) before losing it in a huge upset to Sugar Boy Malinga in 1996, who he overtrained for. Nicky Piper and Lou Gent were career light-heavyweights/cruiserweights, whereas Benn was a natural middleweight, and former and future WBC champions, the Italians Galvano and Vincenzo Nardiello, were two of the biggest spoilers out there -he never took an easy fight! Eubank was engaged again in a 12-round draw, the unbeaten, hard-hitting mandatory Henry Wharton was engaged, and short, squat late substitutes Juan Giminez and Danny Perez were dealt with. Benn by now was a mature champion displaying an improved skill set that consisted of ducking and slipping under opponents punches and backing off to the ropes to counter, as well as beautifully working his jab off the front foot. The title defense that really set apart his reign from most though was a fatefully tragic fight that occured in February 1995, against an American opponent rated as the hardest puncher in the business -harder even than Benn himself! Enter Gerald McClellan. This epic fight and surrounding circumstances would be an article in itself, so I won’t delve into it deeply, only to say that the courage and bravery displayed by Benn in the bout surely sets him apart from the vast majority of fighters in recent history. His last two fights came against strong, rugged warrior Steve Collins, a confident Irishman with an effective style. Benn moved and struck as well as he ever had, but was pulled out by the referee due to inj in the first fight and by his corner between rounds during the second encounter. He finally announced his permanent retirement thereafter and, unlike many former greats, was never tempted into a come-back. He has his money and faculties and now enjoys a quiet life in Spain with his wife and children. Much is to be admired about the man who set the super-middleweight division alight 20 years ago. Next boxing news: Maravilla or Canelo?